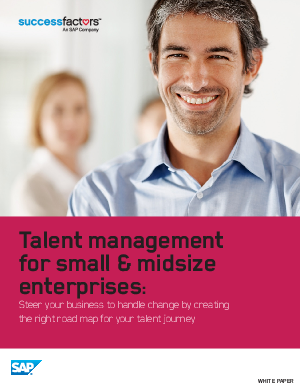 Building a talent strategy for a small or midsize enterprise isn't a one-size-fits-all proposition. The solutions you develop must be specific to the changes you anticipate - from growth to extension and efficiency to innovation. Regardless of the needs driving your business, effective talent management can set you apart from your competitors - and prepare you for whatever the future holds - even erratic markets to explosive growth. While mapping out your talent management strategy may seem overwhelming, it doesn't have to be. SuccessFactors has extensive experience helping companies of all sizes and in many industries get real results from their talent strategies.